On the Farm is where we started and where our hearts still lie. Dad was born on a farm and spent his life farming. He now applies all he knows, plus a little bit of luck, to growing a huge variety of fruit and vegetables on the farm. He has carefully selected the best flavoured varieties for our customers – even if the shelf life is tiny – as we harvest daily throughout the seasons. 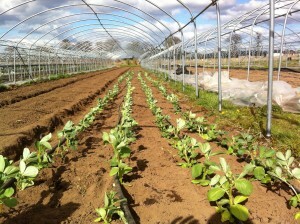 Dad really loves pushing the boundaries of growing to extend seasons and improve the quality of what he is growing. Where we once grew raspberries and iceberg lettuce we have changed and diversified. We grow so many different crops we would be here all day telling you about them. 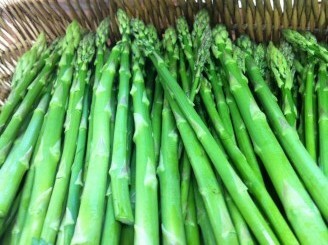 One of our favourite crops and the first ready of the year is Asparagus, we love our asparagus it is so fresh and has such a short season that you have to love it. Fresh and raw straight from the field it tastes of the sweetest fresh peas.